So many DNA matches. How can you decide where to start? DNA tools are on the rise, promising to help us make sense of our growing lists of DNA matches. This week I decided to try out DNA Painter and see why people are raving about it. My chromosomes, painted with about 35 DNA matches. 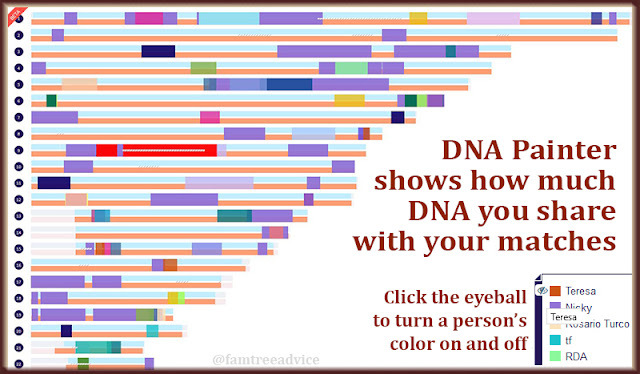 The idea is to visualize how much DNA you share with any of your DNA matches. And where they overlap with one another. 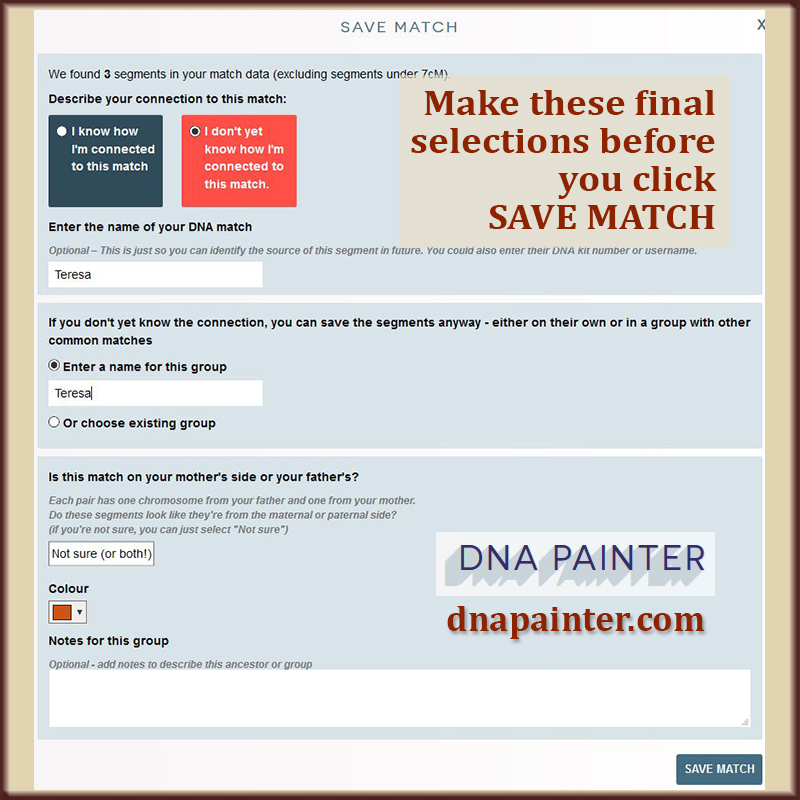 DNA Painter uses data you can find on GEDmatch, Family Tree DNA, and 23andme. I used GEDmatch because my free accounts with the other two don't seem to give me the data I need. 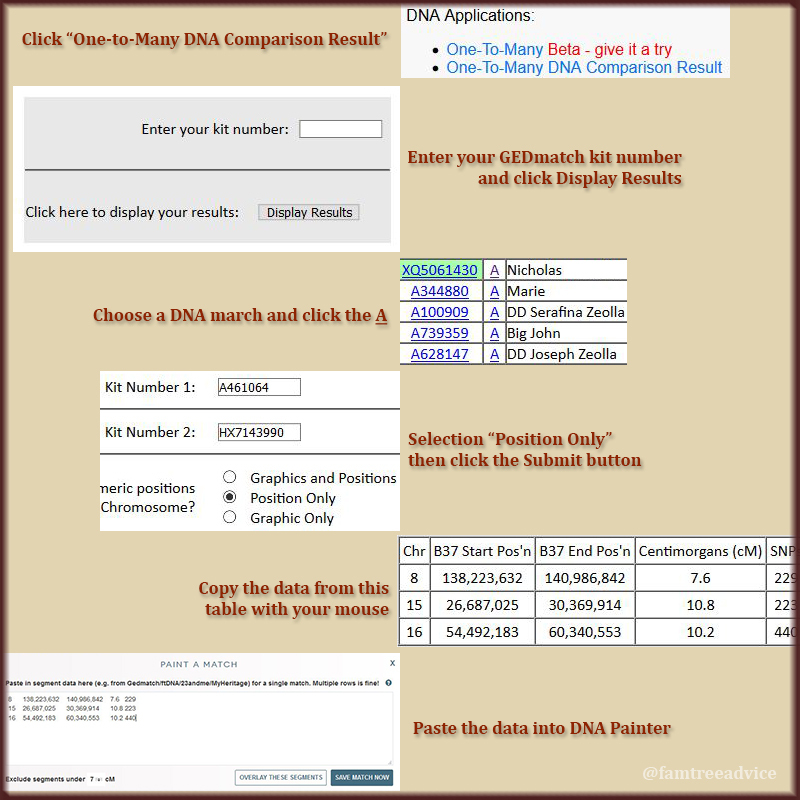 It's really easy to do with GEDmatch. Create a free account on DNAPainter.com and click "Create a new profile". Log into GEDmatch and click "One-to-Many DNA Comparison Result" under the DNA Applications heading. Choose a DNA match with a high number in the "Largest Seg" or "Total cM" column and click the underlined letter A on the left side. Select "Position Only" beneath the 2 kit numbers and click the Submit button at the bottom. You'll see a table full of numbers. Use your mouse to select and copy the table. 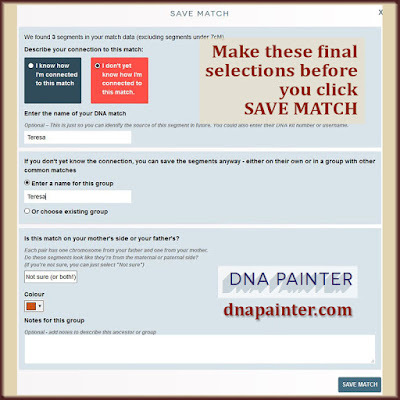 Back in DNA Painter, click PAINT A NEW MATCH and paste what you copied into the box. Click SAVE MATCH NOW. Put your match's name in the box. I've been putting their name in the next box, too, as a name for the group. If you know the match is on dad's side only or mom's side only, choose that. This graphic will help you through the DNA Painter steps. After a while, your chromosome map may be so full you can't find this new match. If so, hover your mouse over the person's color box in the key on the right. You'll see a little eyeball. Click it to hide and show this person. You should be able to find them on your map as you turn their color off and on again. done this once, the rest are easy. Following these steps, I've painted 35 DNA matches plus my 2 parents onto my chromosome map so far. For the moment, let's ignore my parents and my first cousin. My first cousin is the lilac color who's on all but TWO of my chromosomes. I have one DNA match on chromosome 9 with a pretty long block of red color. Let's call him Tony. Tony was the reason I wanted to try DNA Painter. You see, Ancestry DNA says Tony is a distant cousin (a 5th–8th cousin) to me, my father, and my mother! I'm working on the more promising branches of my family tree, but I haven't found their link yet. When I found Tony in my DNA match list, and my dad's match list, and my mom's match list, I had to pursue his ancestors. Tony's tree on Ancestry offered me very little to go on. But I recognized the 4 last names on his grandmother's side of the family. I knew they were from my paternal grandfather's hometown in Italy. The source of Tony's tree was someone else's tree. That tree had almost no sources, and I was able to prove many of its facts wrong. When that happens to you, use the tree as a guidepost, but don't take any of it for granted. Find the proof. There were 2 Pietro diPaola's in town. I'm related to both, and they're a year apart. I thought Tony's Pietro diPaola was the brother of my 2nd great grandmother. But, as I found more of his children's birth records, I discovered he did not match my Pietro. He was, in fact, my Pietro's 1st cousin. This makes Tony my 4th cousin once removed; my dad's 4th cousin. I followed members of Tony's family to America. This helped me gather more facts and dates. Finally, I wrote to Tony to show him how enormous his family tree is now that it's tied into mine. But I'm not finished. I've connected Tony to my father's family through the diPaola name. But where's the connection to my mother? 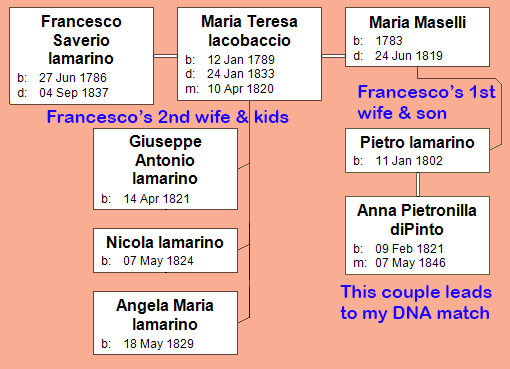 Now I'm trying to find records for Pietro diPaola's wife's family. I know only her parents' names. If I can go further on her branch, will that finally be the key to discovering how my parents are related? What do you think you might find when you use DNA Painter? How many people do you think are opening a DNA kit today? Not everyone finds their DNA makeup or their ancestry intriguing. 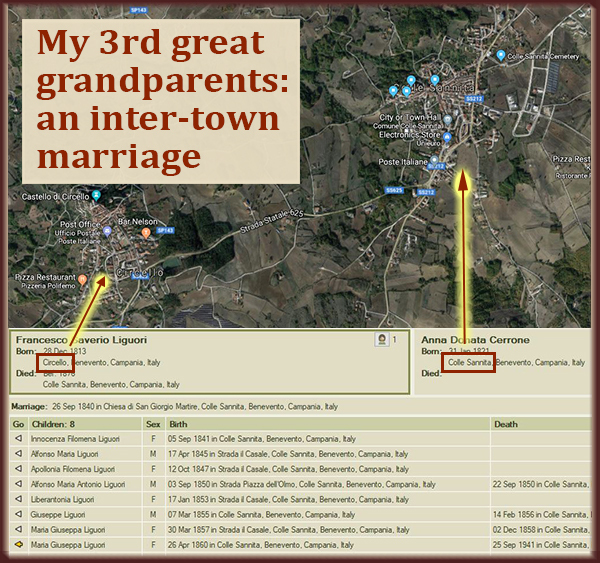 My relatives in Italy barely know about anyone beyond their great grandparents. An Italian man told me he couldn't understand why Americans and Australians were so interested in their ancestry. Don't you think it's logical that people from America, Canada or Australia would be curious? These are countries of immigrants. And, more importantly, immigrants who started arriving relatively recently. If you're from Italy, your ancestors probably lived in the same area for the last 500 years. Maybe before that there were some immigrants from northern Europe or the Middle East. But it's a rare American whose roots in this country stretch back 399 years to the Mayflower. Personally, I had not a single root in America until the 1890s. Before they came here, they were all in southern Italy. I started my genealogy hobby by finding the 1915 and 1920 ship manifests for my grandfathers. Of course I'm curious about who they left behind in Italy! How are you going to feel if your ethnicity is nothing like you expected? Are you ready to collaborate with your DNA matches? You never know who you'll find. Now that you have your DNA, upload it to other websites for other kinds of results. I discovered a ridiculous fact about my parents from my DNA. Doing the research, working with your DNA matches, can lead to exciting new branches to explore. With this method, I think I found the needle in a haystack that will solve the puzzle of my parents' shared DNA. If you're not giving or getting a DNA kit this Christmas, thousands of others are. How many of them will be your match? Like any big puzzle, it helps to start with the edges and find pieces that fit one another. Last time, I told you about a DNA color-clustering method. It shows you visually how you're connected to your DNA matches. This method, and the online tree of a crucial DNA match, showed me where I need to focus. Right down to a specific last name. You see, my parents share DNA. This was a surprise to them, and I'm eager to be able to show them exactly which set of ancestors they share. I'm focusing on the last name Pozzuto in the town of Colle Sannita, Italy. There were a lot of people in town with that name. And they must have been distinct families, because a high number of men married women with the same name. I began by looking at the parents of one key DNA match, both named Pozzuto. The tree is not well sourced, and much of the information comes from my 97-year-old DNA match herself. I have 77 people in my tree with this last name, but that's not enough pieces for this puzzle. I've been trying to confirm the names and birth dates of the people on both sides of the Pozzuto-Pozzuto tree. I find a person's birth record, then try to find their father's birth record and their grandfather's birth record. The goal is to identify someone who is already in my tree with a blood relationship. After adding several people to my tree this way, I realized something. I have a cousin in Italy who's about my age and is named Pozzuto. His mother's side of the family is related to my father's side of my family. So his being a Pozzuto is a coincidence. But…I've always thought he looks like my cousin on my mother's side of my family. What if this cousin, related to my dad but with a resemblance to my mom, is the key? I started digging into the little bit of information he'd given me about his father. I quickly found his father's parents' 1932 marriage documents. I learned my cousin's grandparents' names and kept going until I had some of his great grandparents' names. But I couldn't tie this Pozzuto family to that of my DNA match. Time for a new strategy. Last summer I read about a genealogist's massive effort to build out family trees for everyone in his DNA match list. I think the Pozzuto family is my key. 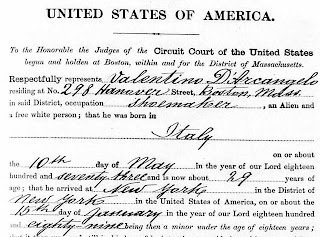 Why not put together every Pozzuto family sitting in my collection of vital records? That's how I built a tree of 15,000 people from my maternal grandfather's hometown. I took the information from each vital record and entered people into a Family Tree Maker file. I placed babies with their parents. 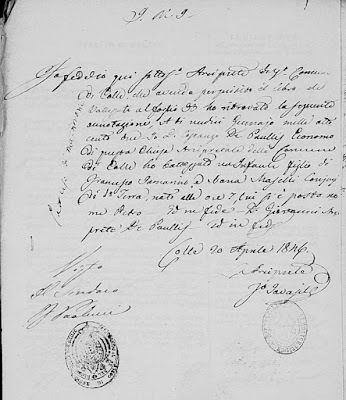 I found the parents' marriage records and gave them their parents. After a while, all the families fit together. These are some of the files I've identified with this name so far. Lots more work to do! I'm going to pick a year, like 1860, and find each Pozzuto baby born in the town. 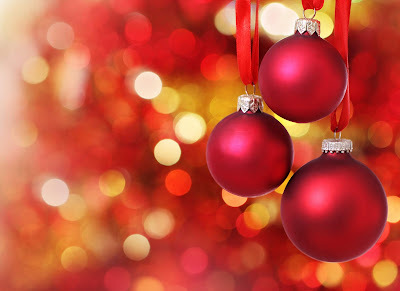 I'll put them in my tree and give them my "no relationship established" marker (find out why that's important). As I go from year to year, I'll find babies that are siblings to the babies I found earlier. I'll build each family. This will take lots of hours, but I'll wind up grouping together Pozzuto families. Some of them will be people I have in my tree already. Eventually I will find a direct line to my DNA match. Still, that's not the goal. I need to find someone in that gene pool who married someone with a last name from my mother's side of the family. All my ancestors came from neighboring towns. The prospect of marrying someone from the next town is very real. I've seen it. 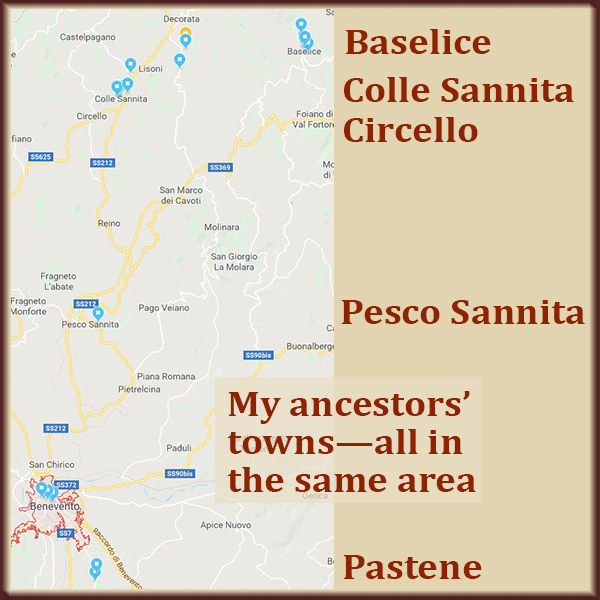 I'm eager to find a girl from Colle Sannita who married a guy from either Baselice or Pastene (most likely). It's exciting to have all those documents waiting for me to read them. The answers are there! I simply need to dig and dig until I find them. Can you do this with your ancestors' towns and your DNA matches? This method makes cousin connections clearer than black and white. Earlier this week I gave up hope of meeting one of my 2018 Genealogy Goals because it was too broad and may never happen. That goal: To find out why my parents share DNA. There's a set of ancestors in my tree that ties my father's and my mother's families together. But now I have a fighting chance of meeting that goal this year. I jumped right in and used Dana Leeds' color clustering method with my DNA match list from Ancestry.com. In the first column I added my parents' names with a 0 in front of them. I added my one 1st cousin who took the test, with a 1 in front of his name. And I added 3rd cousins with a 3 and 4th cousins (the first page's worth) with a 4. The numbers allowed me to sort the names by relationship and then alphabetically. In the end, I used this method on 104 people. Assigning colors to your DNA matches reveals hidden treasures. What you'll do is pick one of your matches and see which matches they share with you. In one column, give that person and all their shared matches a unique color. Find the next person in your list without a color and view their shared matches. This time, in a new column, give this person and their shared matches another unique color. I was seeing a lot of blue (my dad) and green (my mom). But it wasn't until my 10th round of adding colors to shared matches that I saw something amazing. Three people out of 104 had both green and blue. They were a match to both my mom and my dad. Of those 3 people, only 1 has a tree online. I saw lots of familiar last names from my paternal grandfather's hometown. So I wrote to the person who owned the tree. She administers the DNA test for 1 of the 3 important matches. She told me that the DNA test was for her paternal grandmother, and that I must be a match to her father, too. Yes, I am! Her father is also 1 of the 3 matches. From what she told me, the 2 most important last names tying us together are Zeolla and Pozzuto. As I explored her tree, I saw that facts weren't sourced, but I have all the vital records from that town on my computer. So I can look up people's birth, marriage and death facts. After a while, climbing up and across this tree, I found this one couple. Nicolangelo Zeolla and Giovannangela Pozzuto were the parents of someone in this tree. 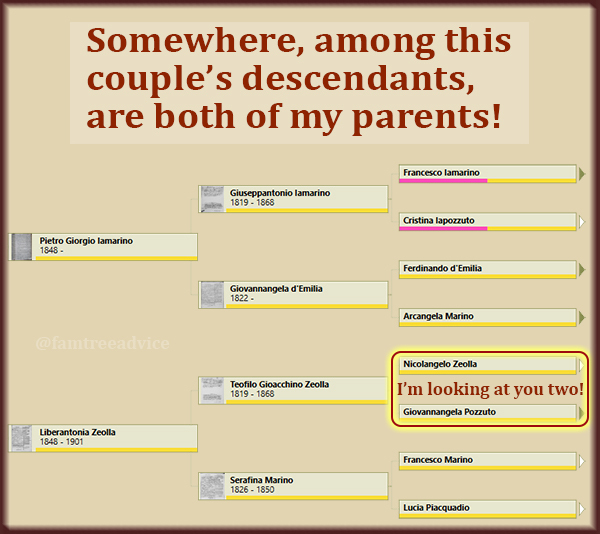 Nicolangelo and Giovannangela are my 4th great grandparents! The Leeds Method helped me identify a potential shared branch for my parents. 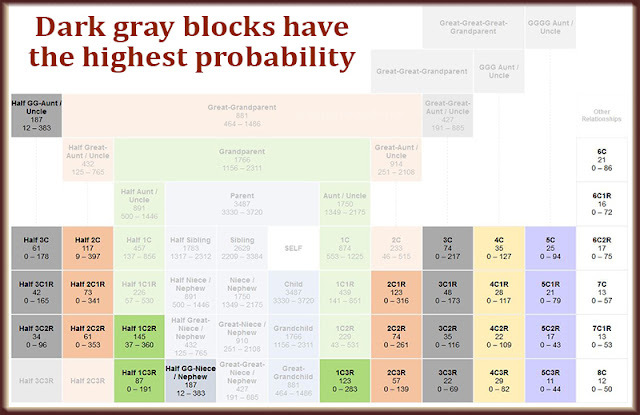 If I hadn't tried plotting the colors as suggested by The Leeds Method, I might never have found the right branch to research. So where do I take this lead? I'm scouring the town's vital records for births and marriages of children in this family. I'll keep building out the individual families. I hope I'm going to find a marriage of someone from this gene pool to someone with a last name from my mom's side of the family. I'm more motivated than ever to find that cousin connection between my parents. And now, it really looks like a goal I can reach. 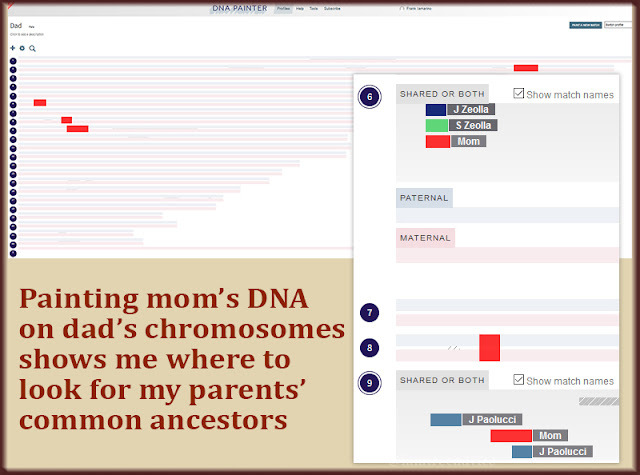 I'm mapping out a strategy to discover how my parents are distant cousins, as our DNA tells us. An analysis of my raw DNA on GEDmatch.com shows that my parents are "probably distantly related". Their Ancestry DNA results predict that they are 4th–6th cousins. That should mean they share a set of 5th–7th great grandparents. I want to find that link between mom and dad's DNA. But there's another piece to this puzzle. My mom's sister's son (my first cousin Nick) is a DNA match for my dad. Ancestry DNA estimates my cousin and my dad are 5th–8th cousins. Nick's related to both my mom and my dad. My mission is clear: Find the set of ancestors that my parents share…and see if they're the same ancestors my dad and my cousin share! they were all pretty close together. My method is less clear. So let's work through the logic. 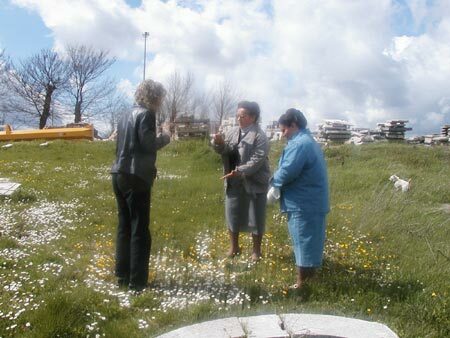 My dad's side of the family comes the Benevento province (similar to a U.S. county). My mother's side comes from the same province. What if, at some point, a man from one of dad's towns married a woman from one of mom's towns? For at least several hundred years, all my ancestors lived no more than 25 or 30 miles apart. Many lived 5 or 10 miles apart, but that's as the crow flies. I've visited these rural, hill towns. They're separated by windy, hard-to-navigate, and sometimes washed-out roads. My husband and I spent nearly an hour trying to get from one town (Colle Sannita) to the neighboring town (Baselice). We thought we'd never make it. That experience got me thinking about how hard it was for my ancestors to go from town to town on a mule-drawn cart. That's why it's more logical to look at towns that were closer to one another. I have 2 main choices. I can concentrate on my 2 grandfathers' towns, the ones that are a nightmare drive apart. Or I can take a hard look at 2 towns that are much closer together. Colle Sannita (Grandpa Iamarino's town) neighbors the town of Circello. They're very close to one another, and the roads don't have to switch back and forth over mountains. Much easier on a mule cart. I've known for years that my cousin Nick's dad's family came from Circello. (Remember, Nick is my cousin on our mothers' sides.) But I found out recently that my 3rd great grandfather was born in Circello. Francesco Saverio Liguori was born in Circello in 1813. 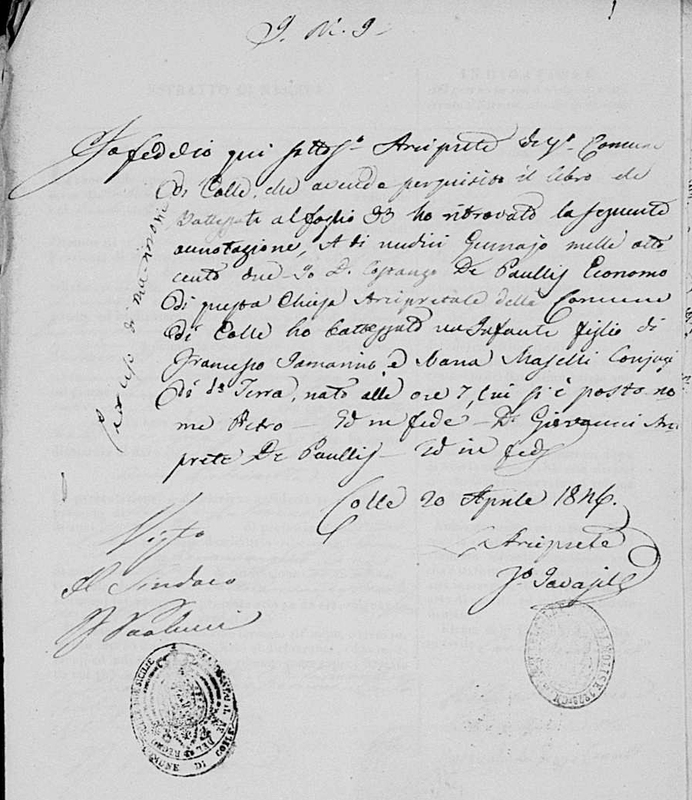 In 1840 he married Anna Donata Cerrone in Colle Sannita, settled there and raised his family. …it seems as if that last name may connect my cousin to my dad. But will it connect my mom to my dad? That's the big goal. Is Nick a DNA match to my dad because of his own last name? Or is the connection through his mom, who is the same distant cousin of my dad as her sister—my mom? Here's the plan I'm going to follow, and hope it leads to identifying that DNA connection. 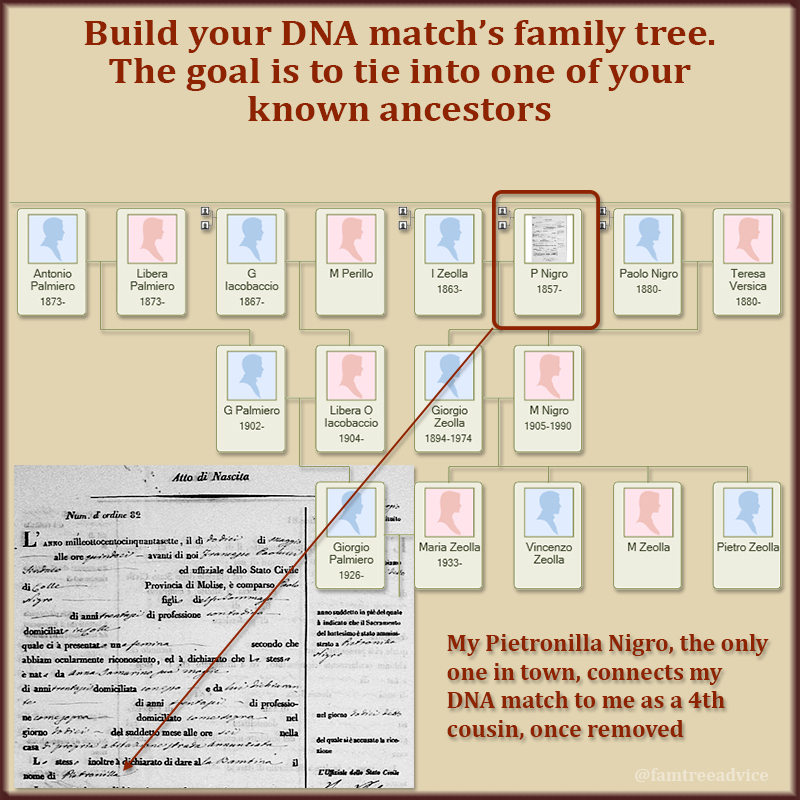 I'll work to build out Nick's Circello branch of the family tree. I'll also work to build out his grandmother's family tree. Why? Because she was from my Grandpa Iamarino's town! His grandparents had exactly the type of inter-town marriage I need to explore. I'll study my grandparent chart and look for last names that don't seem native to their town. 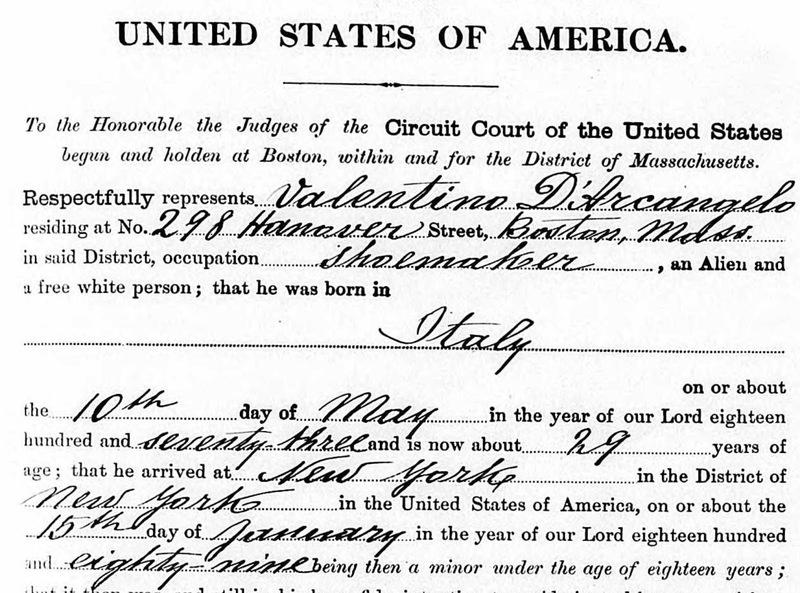 For example, my 4th great grandmother's last name (Tricarico) isn't one I've seen in the town where she lived. Maybe her parents or grandparents came from another town. And maybe, just maybe, her ancestors will tie my mom and dad together. I've spent so much time living among my ancestors' vital records collections, I can spot an uncommon name in a given town. 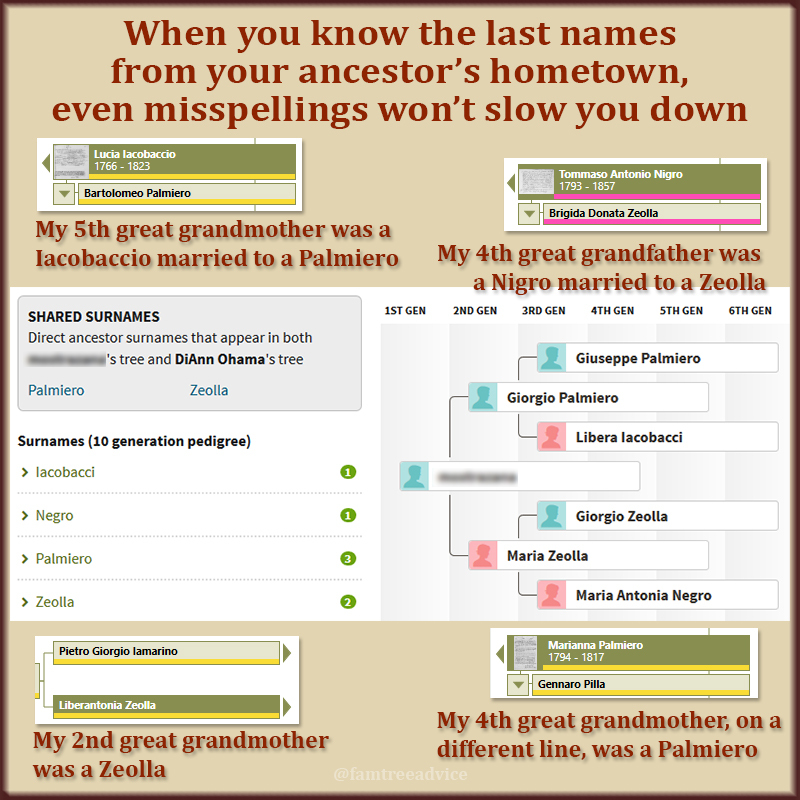 Liguori, my 3rd great grandfather's last name, was out of place. And that turned out to be entirely true. It's important to get really familiar with last names in your ancestors' towns. 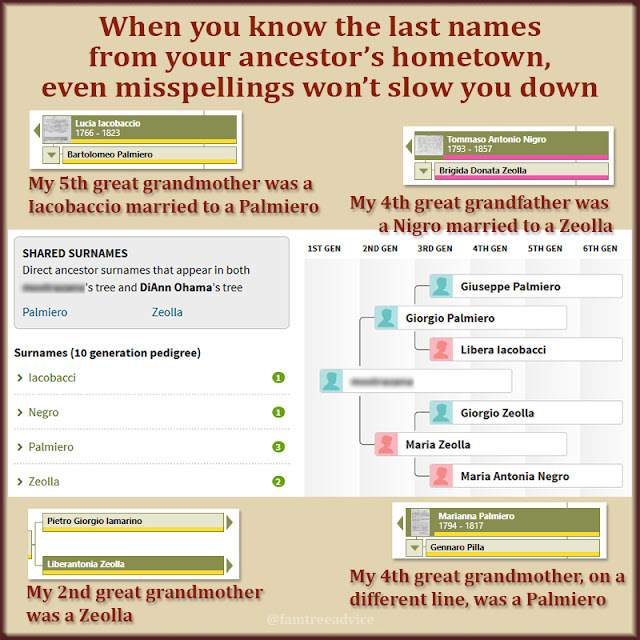 Maybe you can learn the main names in your ancestor's town by looking at land records. Or by paying attention to all the names on the index pages when searching for your ancestor's birth record. Wish me good luck. I'll report back when I think I've found that missing link! Each time you explore a new branch on your family tree, you're sowing seeds that may take years to sprout. Then, one day, it's harvest time. Yesterday a rich and bountiful crop was suddenly ready, waiting for me to gather it all in. Do you know that feeling? The moment you realize a dead end is about to connect to the rest of your tree in a meaningful way? This new breakthrough is going to keep me busy for quite a while. I know this family has a bunch of connections to me. A long-time reader of this blog reached out to me yesterday with her own breakthrough. She'd been studying my tree on Ancestry.com and knew her husband and I had lots of last names in common. More importantly, we had a small ancestral town in rural Italy in common: Colle Sannita. It's very hard to have roots in that town and not be somehow related. Oh, and by the way, her husband and my dad are a DNA match. As I began to dig into this new lead, all the last names were important to me. But one captured my immediate attention. I'd seen this name, Polcini, in the town's vital records I downloaded from the Antenati website. It was always in the back of my mind that my grandfather worked for a man named Polcini in the Bronx in the 1930s and 40s. This man lived in his apartment house. On one of my computer monitors I clicked through my Colle Sannita birth records. I was locating birth records for the Polcini siblings whose names my new contact had given me. On another monitor I opened my family tree software and went straight to my grandfather's 1940 census. Imagine my "small world" feeling. The 1891 birth record for Damiano Polcini on one screen matched my grandfather's next door neighbor on the other screen! The birth record included his wife's name, and there she was on the census, too. But that was the tip of the iceberg. My new contact told me where she thought her husband's family fit into my tree. After a little exploration, I discovered an important connection. One of the Polcini siblings was the grandmother of a distant cousin I met in Canada many years ago. That cousin had given me lots of names to fill out his branch of the tree, but no hard facts. I had zero documentation for his family. Yet. In one evening, I found lots of hard facts to support my connection to my Canadian cousin. But hold up. The Polcini side of my new friend's family wasn't even the possible blood connection to my dad and me. I was so excited to find that one sibling in my dad's 1940 census that I hadn't explored the more urgent connection. You see, my new friend's husband is related to me through the cousins I'm going to visit in Italy in a couple of weeks. They are my father's first cousins, though closer in age to me. I'm related to them through their mother. But now, it looks as if I'm related to them through their father, too! Does this hobby make your head feel like it's going to explode sometimes? I expect to put in a short work day today because I must figure out this connection. The seeds I've planted by going far out on many branches of my family tree are sprouting. And just as the trees are budding outside my window, my family tree is producing new connections. Isn't this why we never grow tired of this hobby? Each time I log into ancestry.com, I see a short list called "Recent Member Connect Activity". It shows me when someone has saved one of my images to their own tree. Most of the images in my family tree are census forms, ship manifests and vital records. I downloaded most of them from Ancestry and attached them to my tree. I don't mind if someone grabs those images for their own use. But I do like to see if I agree with them. One woman borrowed my grandfather's immigration record and turned him into her uncle. He was not her uncle. That careless theft of my grandfather is the motivation for my blog. I want us to be more careful, methodical and scientific in our genealogy research. One of today's "Recent Member Connect Activity" notifications is a possible missing link for me. If this person has done his research well, we are third cousins once removed. You see, my AncestryDNA match list includes a man called Lou. The same Lou borrowed some of my images. Maybe he had extra time during the holidays to work on his tree. Ancestry.com analyzed our trees and determined we are third cousins once removed. My next step is to see for myself that his mother really is part of my Leone family. I'll do this by taking the basic information from his public tree and tracking down the proof on my own. For example, I'll search for documents showing her parents' or siblings' names. If I find that proof, then I will agree with Lou. At that point, I will contact him so we can work together. If he's correct, he will provide me with a new branch. I've documented my Leone family back about eight generations. So if this works out, Lou has a shipload of ancestors to import from my family tree. People who don't want to pay for genealogy subscriptions seem to dislike Ancestry.com. But their constant advertising has exploded the number of people enjoying genealogy. The more people there are working on their tree, the more people we have to share our finds with, and to gain from. Whichever service you use, be sure to reach out to others and learn from each other.